Are You Thinking of Buying a Home in Utah County? 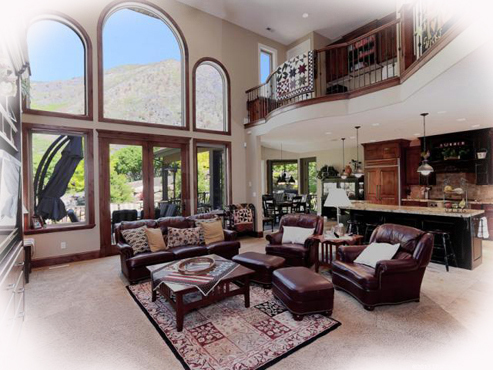 Try our FREE Utah County Listings database, which has every home for sale. After searching for a home, register with us and our system will email you the day a new listing appears in the city in the price range you want. This service has helped hundreds of our buyers find homes. Forget about guesses, appraisals, fantasy dream prices, and inexperienced Realtors' opinions. How about reality? Our service is fast, friendly, FREE and without obligation. We will prepare a 20-page color report comparing your home to similar sold homes. Paul Teasdale is the Principal Broker of Team Teasdale Realty and has been selling homes in Utah County for over 23 years. Hire one of the most experienced Realtors in Utah County to help you buy or sell a home in Utah County. Paul has sold over 1,300 homes in Utah County. What is happening in the Utah County Real Estate Market? The Video on the Left Shows Paul's In-Depth Analysis and Market Forecast for 2016. In 2018 about 2% of the homes for sale in Utah County are Bank Foreclosures. There are less bank foreclosures than short sales in Utah County. Paul has SOLD HUNDREDS of Bank Foreclosures in his 20 year career of selling Utah County listings. Below is a list of all the current Utah County Bank Foreclsoures. This list is automatically updated daily. Paul has been working with the lenders in Utah County for over 23 years. He has selected a few of the best lenders in Utah County. These lenders are very honest and have low, reasonable prices. Work with a lender who gets you the loan and provides exceptional service. See What Our Past Clients Are Saying About Our Service! After selling homes in Utah County for over 23 years, Paul has learned to listen carefully to his clients' needs. Buyers and sellers who have hired Paul and his team have posted 5-star ratings on Zillow and Google+. Take a minute and see what others are saying about us. Do You Need Help Finding a Utah County Home Inspector? Paul has worked with many Utah County home inspectors. He has made a list of all the home inspectors in Utah County. However, he has a few that he feels offers outstanding service and great value. Feel free to look at the list of all the professional inspectors. List of Utah County Short Sale Homes Available Right Now! In 2018 about 2% of the homes for sale are Utah County Short Sales. The approved Utah County Short Sales have been price-approved by the bank. The unapproved Utah County Short Sales have not been price-approved and are often difficult to purchase. Paul has SOLD HUNDREDS of Utah County Short Sales. It is possible to purchase an unapproved short sale, but you typically need an assertive Realtor to help you get your offer in first position. Above is a list of all the current Utah County Short Sales. This list is automatically updated throughout the day. The 19-minute video above is a step-by-step tutorial explaining how to buy a Short Sale in Utah County and how to get the Short Sales first. After watching this video, you will be one step closer to buying a Utah County Short Sale. Forget about guesses, appraisals, dream prices, and inexperienced Realtors' opinions. How about reality? Our service is fast, friendly, FREE and without obligation. We will prepare a 20 page report comparing your home to sold homes. Let's get started! SOLD 92 homes in 2017.